Preheat oven to 375'F. Line a cookie sheet with parchment paper. Unwrap the chocolate and break into pieces. Place in a microwave-safe bowl and cook on high for 90 seconds, or until melted. Stir until smooth and set aside to cool. In the bowl of a mixer combine the butter and sugars. Beat on medium speed until smooth. Add the baking soda and salt, and mix to incorporate. Add the egg and beat on medium until smooth, about one minute. Add the food coloring and vanilla and mix well. Scrape down the sides of the bowl and add the melted chocolate; mix well, about one minute. Scrape down the bowl again and add in half the flour. When the flour is incorporated, mix in the sour cream. Add in the rest of the flour. Stir in the chocolate chips. 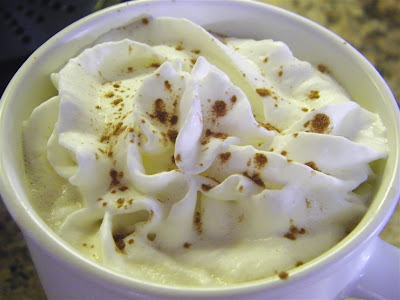 Mix the softened butter with the softened cream cheese and vanilla until the mixture is smooth. 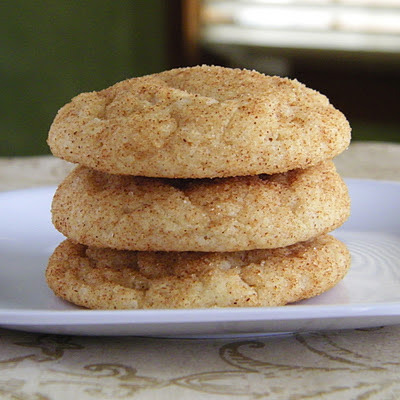 Add the confectioner's sugar in half-cup increments until the frosting is of proper spreading consistency. Katy's notes: The vanilla in the cookie batter was my addition. The first pan I baked, I made the cookies and little small and they were slightly overbaked. I increased the size for the next pan and that worked better. For the food coloring, I used Wilton No-Taste Red gel coloring. How cool! This is one of my favorite cakes, never thought I'd see it in a cookie, very neat :). 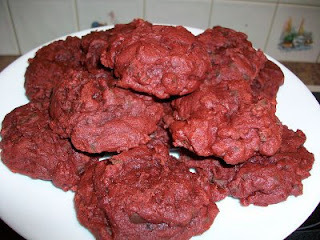 Red Velvet cookies! How cool! Diane Mott Davidson writes in a similar style like Fluke. She even includes recipes as well. They look fabulous! I love to bake cookies and yesterday made malted milk ball cookies! Welcome to the foodie blog roll.